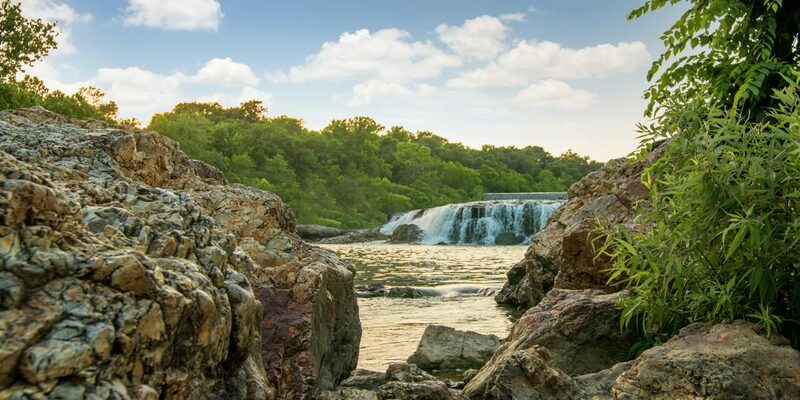 Explore the natural beauty of the Ozark foothills. Discover a cascading waterfall. Walk winding trails at Wildcat Glades Conservation & Audubon Center or tour a National Park Monument. Enjoy sipping wine and strolling through a vineyard. 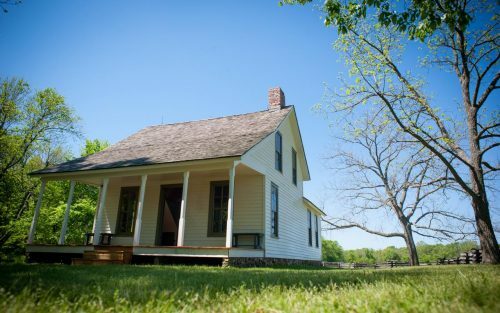 Located at George Washington Carver National Monument, the 1881 Moses Carver house is one of the stops along the historic tour of the park. been preserved inside this 240-acre national park. The park consists of the Visitor Center, 1881 Moses Carver house, Carver cemetery, a ¾-mile nature trail that is partially accessible and a ¼-mile contemplative trail. Receive a Joplin Welcome Gift when you check into your group-friendly hotel. Relax before departing for dinner at Granny Shaffer’s Comfort Food Cafe. Enjoy home-style cooking and save room for pie. Begin the day with breakfast at your hotel before departing for a day of fun and adventure. Arrive at one of the Joplin area’s U-Pick berry farms. Joplin has locally owned farms that offer berry picking in late spring and early summer. The Heritage Family Farm and Robertson Family Farm are both great choices. It’s always fun to bring your own berries to tomorrow’s breakfast. The Webb City Farmers Market features local music and producer-only products. Plan your day around the market’s hours: Tuesday, 4-7 p.m. (April-October); Thursday, 11 a.m.-2 p.m. (April-October); and Saturday, 9 a.m.-noon (January-December). It’s on to nearby Oronogo, Missouri, and Keltoi Winery. Established in 1997 by Erv and LeeAnn Langan, Keltoi produces more than a dozen types of wines, including Iris Raindrops, a smooth, semi-sweet white wine that’s a customer favorite; the Norton, a superb dry red wine made from Missouri’s state grape; and fruit wines, such as apple and pear. Customers are invited to explore the vineyard grounds on a mile-long walking trail. A box lunch will be waiting. Picnic with a bottle of wine beside Little Northfork Creek or in the vineyard itself. Complete the afternoon with a visit to Neosho National Fish Hatchery in Neosho, Missouri. It is the oldest operating federal fish hatchery in the United States. Established in 1888, the hatchery is located in the Ozark Mountain Region of southwest Missouri. It is one of 70 hatcheries operated by the U.S. Fish and Wildlife Service. Return to your Joplin hotel for some relaxation before dinner at Club 1201. Using locally sourced ingredients whenever possible, Club 1201 has a reputation for creating memorable meals. Breakfast at the hotel before departing for another adventuresome day. 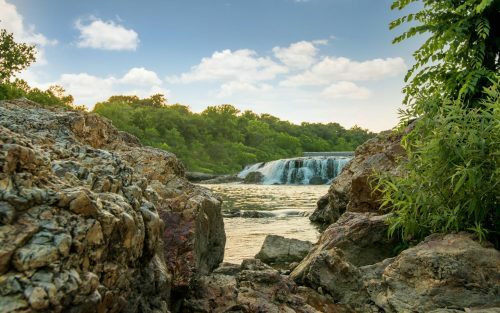 Missouri’s largest continuously-flowing natural waterfall plunges 12 feet down a 163 foot wide ledge of solid chert, crashing into the rocks below and drifting peacefully down Shoal Creek. drifting southward. This is a great photo opportunity. Just a few minutes upstream from Shoals Creek, you’ll arrive at Wildcat Glades Conservation & Audubon Center. Wildcat Park sits next to some of the last remaining chert glades, a globally unique habitat found only in this area, and the biologically rich Shoal Creek where migratory birds and other wildlife thrive. Next stop is Sandstone Gardens, a 50,000-square-foot showroom of accents and accessories for home and garden. Lunch at Sandstone’s Bistro in this turn-of-the-20th-century estate features homemade entrees and desserts. It’s on to some more adventure at Water’s Edge Camping and Kayaking, 43 acres of raw southwest Missouri beauty. Shoal Creek meanders through the grounds. Swim, fish, kayak, canoe or float the afternoon away. Return to your Joplin hotel for rest before departing for dinner. Wilder’s Steak House, located in an historic building (with stories to tell), has been doing business since 1929. It’s a classic steak restaurant with a menu that’s sure to satisfy any group’s hunger. Depart Joplin this morning with fond memories of fun and adventure.